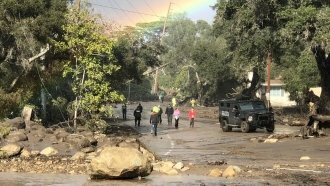 At least 17 people are dead after powerful mudslides wreaked havoc on California's Santa Barbara County earlier this week. At least 17 people are dead after powerful mudslides wreaked havoc in California's Santa Barbara County. Officials said Thursday 28 people were injured by the slides and eight are missing. Authorities say the death toll will likely rise in the disaster, which was fueled by heavy rains and flash flooding. A spokesperson for the Santa Barbara County Fire Department told The New York Times officials are "still in the hopeful, optimistic mode" that they can rescue more survivors.